eBay has been making a lot of headlines recently, but not in a way that is likely to please its investor relations department. The trouble started with a data breach in late May that compromised its entire user database, bringing punitive action from Google that has resulted in lower search visibility of its web pages. Additionally, both eBay Marketplace and PayPal are now facing ramped-up competition from the respective launches of 11 Main, Chinese e-commerce giant Alibaba’s U.S. online retail debut, and Amazon’s subscription billing and recurring payments service. On top of everything, PayPal head David Marcus announced on June 9th that he is moving to Facebook to direct its messaging app, and there is speculation that he will also be there to help Facebook develop its own payments service. Reflecting this series of unfortunate events, eBay’s share price has dropped near its 52-week low of 48.06, as shown in the chart below. Here at Stock Rover, we’ve been wondering: do these developments present the perfect opportunity to snap up shares of eBay at a bargain price, or will they instead shadow the company’s long-term prospects? To answer this question, I decided to take a closer look at eBay from an investor’s perspective. Capital Efficiency: Bang for the Buck? My first step was to create a watchlist for eBay and its major competitors in the consumer cyclical and financial services industries. I will compare them in several key financial metrics. What I immediately noticed was that eBay’s EV/EBITDA is significantly lower than that of its competitors, about a third less than Visa’s and MasterCard’s and nearly three times less than Amazon’s. This indicates that eBay is a good deal less expensive than its competitors. I chose to use EV/EBITDA rather than Price/Earnings, because it accounts for differences in debt structure between the various types of companies on the list. According to these metrics as well, eBay is less expensively priced than its peers. Amazon’s lower P/S can be attributed to its incredibly high sales volume. 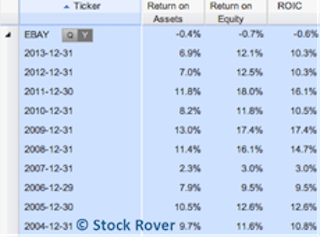 Notably, eBay’s low PEG forward suggests a favorable ratio of share value to expected growth. I wanted to see how investors are currently feeling about EBAY, so I took a look at some momentum indicators. 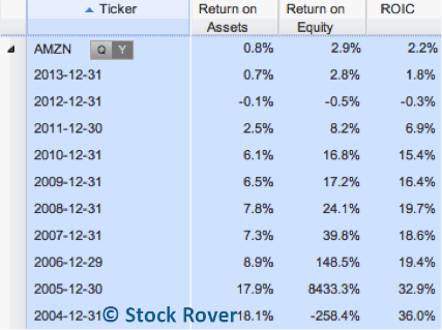 What they tell me is that, from a technical standpoint, EBAY is currently out of favor with investors. EBAY’s RSI and MFI indices of around 30 are lower than those of its competitors, and they indicate that the stock is oversold. This is also illustrated by its current pricing at the low end of its 52-week range. But does all this suggest that eBay is a spectacular value or that something is fundamentally wrong with the company? Because if the company is sound fundamentally, then being so out of favor technically gives the stock potential to bounce back. eBay’s income statement exhibits an interesting trend: its numbers all lie midway between those of Amazon, a retailer, and Visa and MasterCard, payment processors. This makes intuitive sense, as eBay’s business is a hybrid of retail and payment processing. Its net income, calculated by GAAP standards, comes up negative because of its recent repurchase of 1.82 billion shares of stock and repatriation of $9 billion in foreign cash, with a tax of $3 billion. Thus, in this case, operating income is a more appropriate measure to go by. Compared to eBay, Amazon has five times more sales but less than one-fifth the operating income. Amazon’s cost of sales relative to its sales is also considerably higher than eBay’s, revealing that, although Amazon is making more sales, eBay is more efficiently reaping profits. While the net income, and consequently the net margin, has jumped around a bit, it shows a general upward trend. The operating income has increased every year since 2009, and the operating margin has hovered steadily around 21%. 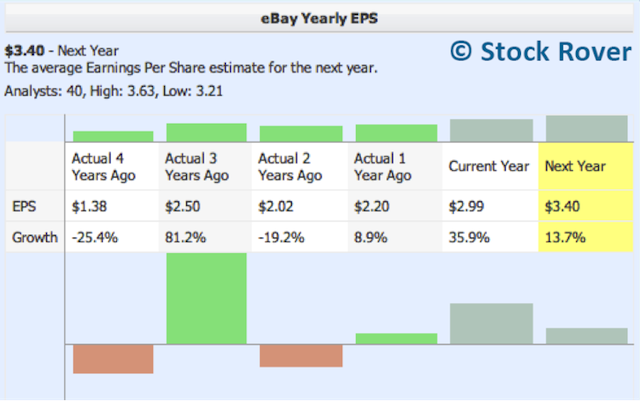 eBay’s EBITDA exhibits the same trend, with a healthy 30-31% margin over the past 3 years. It has also seen quite rapid sales growth, averaging 14.6% annual growth over the past five years. Solid margins mean that eBay has ample money left over to spend on acquisitions and improvements to its existing services. 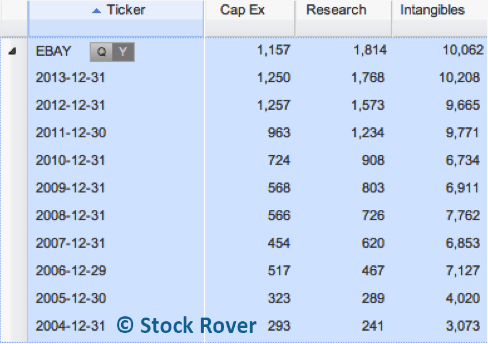 eBay’s balance sheet (above) also looks clean. While its debt is going up, its cash is as well. As evident in its income statement and balance sheet, eBay has plenty of money on hand to channel into investments to grow its company. In fact, these intentions underlie its aforementioned repurchasing of stocks and repatriation of foreign cash. Indeed, eBay is channeling significant cash into capital expenditures and research, and even more into intangibles. Thus, eBay is growing not only organically but also via acquisitions. This is definitely a good sign, as it means that the company believes in itself and is looking to grow. Though these expenditures may take a toll on the net income as of now, they should transform into future profits given eBay’s track record. eBay’s financials seem to show that it is a healthy and well-run company, but let’s look at its capital efficiency in order to assess its productive use of capital. The return on assets, return on equity, and return on invested capital metrics tell us whether the investments a company is making are paying off, and thus translating into profits for investors. I’ve included Amazon for comparison. Note: Since these measures are calculated with GAAP net income, the results are negative for the first quarter. 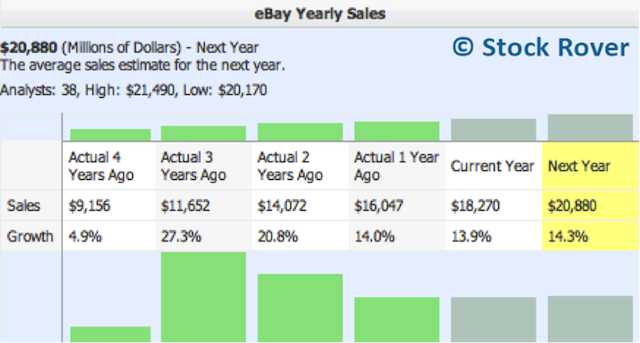 eBay’s return metrics have jumped around, and, while they all move in the same direction, they offer no discernable trend of improvement or deterioration. Thus, as of yet, ROA, ROE, and ROIC are all inconclusive on whether the company’s investments are paying off. While it would be preferable to see a steady increase in returns, eBay’s numbers are more comforting than Amazon’s, which range from the negatives to 2.9% over the past 3 years. Enterprise – allows eBay to partner with retailers and brands that wish to expand their online presence through order management, fulfillment, and marketing services. To see how each segment contributes to the main business, I generated a chart of their net revenue growth over the past five years. 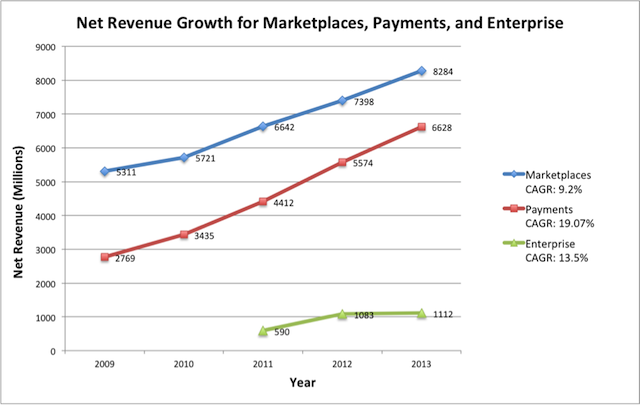 Here, we can see that Marketplaces is still eBay’s main source of revenue and is seeing steady net revenue growth. However Payments proves to be eBay’s main driver of growth. The sector brought in 41% of eBay’s total revenue in 2013 and, with a compound annual growth rate (CAGR) of 19.07%, it is gaining on Marketplaces. Slightly slower Payments revenue growth over the past year of 18.9% can be attributed to investments in platform growth initiatives, such in-store PayPal tests and its recent acquisition of Braintree Payments. Enterprise, eBay’s smallest sector, is at this time not meaningfully contributing to the company’s growth, though it could play an increasingly important role with more and more retailers seeking to build up their online businesses. Looking at eBay’s EPS growth gives a better sense of how the business as a whole is growing. The graph below shows that eBay’s EPS has fluctuated quite dramatically over the years but is expected to grow by 13.7% next year. eBay’s EPS trends also show that analysts are expecting solid earnings growth from eBay going forward, and they are holding steady in that view. Sales are predicted to grow by a similar rate of 14.3% next year and have seen steady growth for the past 3 years. It’s good to see that EPS and sales are growing together, as it means that revenue growth is performing well. Given that eBay is exhibiting steady double-digit growth and healthy finances, it is definitely looking undervalued right now. There are still two important questions to be addressed: Is eBay’s current fast-paced growth sustainable in the long run? And can it weather the recent blows it has taken? Let’s start with eBay’s Marketplaces segment. Marketplaces clearly faces heavy competition from the Goliath that is Amazon, though I feel that there are enough differences between the two online retailers to give eBay substantial staying power. Though Amazon offers a bevy of attractive perks to buyers such as ever-faster shipping and add-on items, eBay is still the place to go if one is on the hunt for excellent deals on brand name, used, or vintage items. Moreover, there will always be a segment of buyers and sellers who favor eBay’s auction format to Amazon’s fixed prices. eBay has also undergone several changes as of late in order to better compete with Amazon. It has moved away from a strictly auction format to provide more and more fixed price offerings and revamped its Cassini search engine to create a better experience for users. Just this Tuesday, it launched eBay Valet, an app that essentially sells items for users, from estimating the item’s retail value to communicating with buyers, for a 30% commission. eBay has also put focus on expanding and improving specific verticals such as auto parts and fashion. One such example of this is eBay’s recently unveiled Designer Collective, through which customers can shop directly from high-end brands such as Cynthia Rowley and True Religion. In regards to competition from 11 Main, I believe that eBay is safe for now. 11 Main’s angle is to create a niche marketplace for local businesses to sell specialty goods rather than to compete with the likes of Amazon and eBay. And though it’s hard to tell how 11 Main will grow in the future, eBay, with some 145 million users, has a wide economic moat. Current users of eBay and Amazon won’t make a shift unless they have a significant incentive to do so, and both companies are innovative enough to grasp on to their customers. The data breach, too, should not have a major impact on eBay. Given the performance of other companies, such as Sony and Adobe Systems, that have undergone similar breaches, eBay’s long-term stock price should not be negatively affected, and most of its customers will not be deterred from using its services. eBay surely is well aware of its cyber security flaws and will take steps to correct them. Lower search engine visibility for eBay webpages on Google is rather problematic, as it is likely to cause some sellers to flee to Amazon. However, sellers should take comfort in knowing that many customers, myself included, search for products directly from eBay.com rather than through Google. eBay may also be able to come up with ways recover its Google rankings. For now, it looks like eBay Marketplaces’ biggest threat is still Amazon, not search visibility. Even if Marketplaces sees slower sales in the future, Payments should have no problem carrying the company’s growth. PayPal currently has over 148 million active accounts worldwide and is seeing continued expansion through the development of its mobile platform and offline point-of-sales services in partnership with Discover (DFS). PayPal is also well positioned for emerging markets: 40% of its active user growth is coming from mobile users, which are on average younger, and it processes 20% of global online retail transactions, as estimated by Morningstar analysts. It is true that PayPal faces heavy competition from the likes of Visa’s V.me, Amazon’s Payments, and MasterCard’s PayPass, just to name a few. However, like eBay, PayPal has a strong economic moat due to the vastness of its user network – it will take a while for new competitors to amass a comparable user base, and current users may be discouraged by the switching costs. Moreover, PayPal has made several very smart acquisitions that have further increased its reach and value. For instance, PayPal’s acquisition of Braintree in 2013 not only gave it merchant account, payment gateway, recurring billing, and credit storage capabilities but also Venmo, the popular app that allows users to pay friends directly. Recently, eBay has announced some exciting developments for its Payments sector. It plans to build an office in Chicago, where Braintree is headquartered, and pledges to hire 360 employees over the next three years. It also launched PassPort last week, which is a site that will provide its merchants stats and information for selling internationally. Alongside the development of PassPort, PayPal has acquired AppTek, a company that creates machine translation and automatic speech recognition software. These moves clearly point to eBay’s emphasis on growing its Payments sector, especially in terms of mobile and international expansion. When PayPal acquires startups, it also acquires the brains and talent behind them, such as Braintree president Bill Ready and eight members from the AppTek team. These additions, in lieu of former director David Marcus, will hopefully provide the innovation eBay needs to keep afloat of looming competition. eBay’s current business is definitely in the right place at the right time: ecommerce, mobile and alternative payments, and international markets are all pegged to see high growth. Added to that, eBay has a load of promising investments under its wing. For a profitable business that is growing extensively, its low valuation right now makes it a compelling long-term value. Though the heavy competition it faces now and in the future should be taken into consideration, EBAY is still a stock I’d add to my cart.